You may or may not know that arrival by car to the Cinque Terre can be a bit hairy and anything but convenient. The roads are very narrow and winding, parking is extremely limited and quite expensive, there’s a pretty high risk of getting a ticket (if you accidentally enter the ZTL zones or park where you aren’t supposed to) and the historical centers of the villages are pedestrian-only. My advice? Ditch the car before hitting up the Cinque Terre. If that’s not feasible, you can do the next best thing and park it at the Park Centro Stazione underground parking garage at the La Spezia Centrale train station. Current published rates for Park Centro Stazione for 2019 are €1.50 per hour from 8am to 8pm and €0.60 per hour from 8pm to 8am. That means the daily rate (for a full 24 hours) is €25.80. This parking garage, thanks to its rather recent construction, is pretty avant-garde for these parts with an elevator that will take you directly to the station, restrooms, 64 closed-circuit cameras to monitor the garage, PIN code access (to both the restrooms and the garage in nocturnal hours) and full automation. Of course, you’ll still want to follow common sense rules of thumb like locking things up and not leaving valuables in sight. There are automated signs near each entrance indicating how many spaces are still available for that level. If one level is full, be sure to check the other entrance to see if that level is full, too. This parking garage used to take advance reservations (which was great!) but the booking system wasn’t super intuitive and last year they suspended the reservations link, promising it would be back online by October 1st, 2018 (which never happened *sigh*). In my opinion, they realized that the advance reservations were more hassle than they were worth (since the garage fills up even without them). It’s a shame for people who like to plan in advance (like me). Keep in mind that they have only 10 spaces available and it’s mandatory to book and pay online in advance (don’t just try and turn up). The 2019 daily rates are €18 for off-season and up to €25 for peak-season (keep in mind that they don’t offer hourly rates). You can arrive any time after 10am (you’ll be provided with an access code after you’ve booked) and you’ll need to retrieve your car no later than 10am on your day of departure. Heads up: If you plan to leave later in the day, you’ll need to book & pay for an extra day. You can check train times and schedules here. Enter the station that you’d like to leave from (in this case, La Spezia Centrale) and the name of the station where you’d like to arrive… et voilà! You can purchase tickets in advance on the aforementioned website (it’s the official TrenItalia website) or you can wait and purchase them in person at the station (but know that the lineups can be long!). Want a Plan B (or C) option in case the garage is full when you turn up? Read my blog post detailing parking for free at the La Spezia Migliarina station here. If you’re not a fan of streetside parking, check out my post on two other public payment parking garages in La Spezia. Yes, you’re right… finding parking in Italy can be a challenge. That’s why I like this option so much (as you can reserve your space in advance so you’re guaranteed to have a parking spot). Thank you! I googled ‘where to park a rental car in La Spezia’ and your blog was the perfect answer. We are headed to Cinque Terre May 9 and I am going to do more reading here before we travel. Thank you. This is so helpful! Thank you. Will be there in May and had no idea what to do with the car. What village are you staying in? 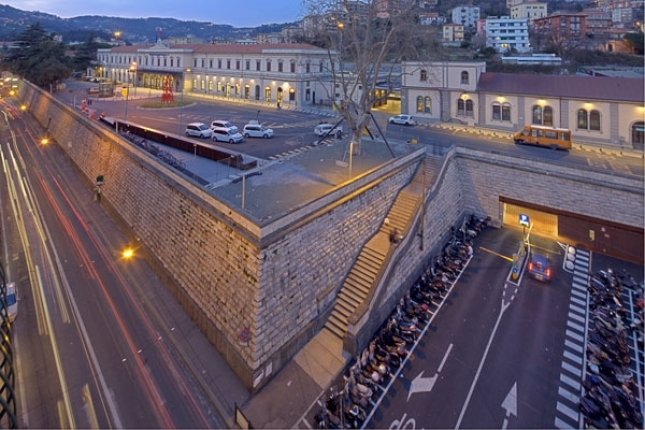 There’s the possibility to book a parking place at the underground garage at La Spezia Centrale (there’s a blog post talking about it here: https://cinqueterreinsider.com/2015/04/16/parking-a-great-alternative-for-those-driving-to-cinque-terre/ ) and then you can take the train to Cinque Terre. Thanks for all the great info here. Could not do without it! I took you advise and booked my parking at La Sezia for July 9th. Received a PDF back with a line that reads Codice Sosta. I assume this is the code for entry? Also, purchased before noon to after noon on July 9th for 18 euro Question…That entitles me to arrive in the AM and leave in the PM on the 9th ? Thanks so much. Thanks for reading the blog! “Codice sosta” is your access code that you’ll need to punch in on the keypad when you arrive to the garage. A card will be printed that you’ll need to retrieve and then the gate will lift allowing you to enter. Upon departure you’ll just need to insert the card at the gate and you’ll be allowed to exit. Easy peasy! You’ve booked so that you can arrive anytime from 12:00am to 11:59am and exit anytime between 12:00 noon and 11:59pm. I hope this helps! My husband and I just did the same this past week and everything went without a hitch!! You just enter the code and go right in. Thanks Amy!! I tried to reserve a parking spot in La Spezia, but the website is asking for a plate number. We will be renting a car, so do not have that information. Any advice? Hi! Great info. We will arrive there in 2 days. What is the address of the parking you are mentioning? You can enter La Spezia Centrale train station on your GPS. Once there, the entrance to the -2 level of the garage (where you can reserve spaces in advance) is on via Fiume. We are trying to rent a car to drive from Cinque Terre to Alba on June 2. I just found out that it is a national holiday. The car rental places seem to be closed that day. I thought that perhaps I could rent a car in La Spezia the evening of June 1st and park in this parking lot over night and then access the car in the morning on June 2. I tried using the online reservation, but it says there are no spaces available. Would you know if this is because the parking garage is also closed for the holiday on June 2? First and foremost, you’ll want to check the hours for the car rental place in La Spezia as they tend to have limited hours (especially in comparison with airport locations). The parking garage is open 365 days a year. With it being a holiday period, I’m sure they are booked out for the spaces that are possible to reserve in advance. The remaining spaces (at the -1 level) will be available on a first come, first served basis. The automated signs for the parking are super clear and will tell you precisely how many spaces (if any) are available. Thank you very much for your reply! That helps a lot! I will be sure to check on the car rental hours. This sounds like a fabulous option! However, do you know if it’s safe to leave the car there while I go and stay in one of the towns for two nights? It is a much safer option than street side parking and there’s video surveillance, keypad entry during nocturnal hours, etc. Of course, common sense dictates that nothing of value should be left in sight (use the trunk of the car if you’re leaving anything behind). Wonderful! Thankyou so much for the advice! We will definitely use this if we cannot organise private parking through air bnb. PS. Your blog is just perfect for cinque terre newbies like myself! I just tried to reserve a space for next week and unfortunately all spots are filled. If when I arrive level 1 is also full, do you have any other suggestions on parking? The only bad thing about driving is that cars don’t really fit in your handbag! You can try to park at Piazza d’Armi in La Spezia if the two underground garages are full at the station. The parking at Piazza d’Armi is free, uncovered and usually a bit scarce. It’s quite a few blocks from the station (I’d say a good 10-15 minute walk). You may want to drop your luggage and one person at the station while the other goes to park there. Based on what you’ve told me, I think your best bet will be to park in Monterosso and pick up the ferry there (even though it’s further than the other villages, there’s more parking available and because it’s flat it will be easier with the kids). Take the autostrada A11 from Lucca towards Viareggio and then merge onto the A12 in direction Genova. Exit the autostrada at the Carrodano/Levanto exit and then follow the signs for Monterosso. The trip should take you about an hour and a half. Your blog is so wonderful – it’s by far the best and most interesting information I’ve found on Cinque Terre. Thank you for all the interesting and informative reading. In the beginning of July, we’re driving from Tuscany, will spend 3 nights in Vernazza and then we drive to Malpensa Airport. We want to park the car in either La Spieza or Monterosso. Which town do you think we should park in? Is there street parking in Monterosso? I’m used to parking in San Francisco so I’m used to spending some time looking for parking!! Part of the decision about where to park will be where we want to leave from on the morning we have to drive to the airport. The drive from Monterosso to the airport seems to be about 20-25 minutes longer (depending on traffic) than the drive from La Spieza. The 20 minutes isn’t a big deal…but curious what you think about which drive do you prefer – the drive from Monterosso or La Spieza to the airport? If one of the drives is more spectacular, it might make sense to park in that town. We love to hike so we’re planning on spending our time hiking between all of the villages. Please pardon the delayed reply. Life has been… busy! We have TWO little ones at home now. EEK! In your case, I would probably park in Monterosso. There’s a large payment parking lot right down on the beach in Fegina (the newer portion of Monterosso). From there it’s an easy walk to the station, where you can hop on a train to Vernazza. As for the drive to Malpensa, I personally prefer going through Genoa (Genova) as it’s more scenic. Also, the other alternative (heading towards Parma) always seems to have road construction in progress (which can potentially cause delays). Thanks for the great advice. We will be traveling to Italy in September and would like to take a day trip to CT. Do you think it is is possible to arrive at the parking lot and get a spot without reserving in advance? While it *is* possibile to just turn up and find a spot, I personally would book a space in advance (granted, I’m a planner). If you decide to wing it and not reserve in advance, I recommend trying to time your arrival early in the day (as you’ll have a better chance at getting a spot then). You sent me a very helpful suggestion for a an itinerary around the cirque terre that didn’t start from la spezia but I can’t locate it. It was a few weeks ago but I can’t find a way to search this blog. Is there a way you can help me? Hi Amy, thank you for your wonderful blog. Quick question: we have two nights (24th and 25th of July) staying in Monterosso coming up and tossing up between driving to Monterosso or leaving the hire car at your suggested parking spot in La Spezia. From what I read, driving to Monterosso isn’t as bad or troublesome as driving through the other villages in Cinque Terra. Is this the case? Should I be confident in finding a parking space for two nights in a paid garage in Monterosso? In your case, I would probably just drive to and park in Monterosso. Have you spoken with your host to see if they have parking available for you? Otherwise, there’s a large, dirt parking lot (payment required) right on the water’s edge in the newer portion of Monterosso (Fegina). It’s really important that you exit the autostrada at Carrodano-Levanto and NOT La Spezia as the coastal road connecting the villages is interrupted between Vernazza & Monterosso (only authorized vehicles are permitted to pass). Thank you for all the great information! We are driving to Cinque Terre in early November and will decide if we should park in La Spezia or Monterosso. Can you tell me if the train and ferry schedule is different in November than it is in the summer months? Thank you. November is the start of our off-season so you should have no issues parking in either Monterosso or La Spezia. Just keep in mind that the 1st and 2nd of November are holidays (All Saints and the day of the dead) so they could still be a bit busy. After those two days the ferries usually stop running until the following spring. The trains run but won’t be as frequent as the summer schedule (but don’t worry, you’ll still be able to move around easily). It’s important to keep in mind that there are two garages at La Spezia Centrale: one at the -1 level and one at the -2 level. Reservations are accepted only at the -2 level so all of the spaces at the -1 level (with entrance on via Paleocapa) are first come, first served. The earlier in the day, the better your chances are of finding available spaces. There are electronic signs telling precisely how many spaces are available on either level. If both garages are full, and you don’t want to queue up and wait for someone to exit the garage, I recommend seeking parking at Piazza d’Armi, which is about a 10-15 minute walk from the station (I’d drop passengers & luggage at the station and then go park). The spaces there are free (however, there’s no surveillance like at the station). Another free parking area is located on via Fieschi, in front of the stadium (it’s even further of a walk, though). Remember: Blue lines = payment parking, white lines = free parking. First, thank you for all of your help. I was planning on parking for 4 nights and when I attempted to reserve in advance, only the first 3 nights were available for advanced reservations. Are the reserved spots numbered? What would happen if I reserved 3 days and then picked up “late” on the 4th day (since there is unreserved spots for overflow)? Is there an alternate advanced parking option to consider? Doubting to reserve a parking space beforehand or to just turn up, we ended up doing the latter one 🙂 Thinking it was (mid) September it shouldn’t be much of a problem. Anyway getting there was a bit troublesome (because: Italian roads and roadsigns) but with our GPS we manage to find it relatively easy. The garage was full, as we kinda expected at around 13:45h, but luckily there was only one car in front of us (the cue did however grew quickly after we arrived!). After about 10-15 minutes the guy in front of us had enough and left and barely 30 seconds later someone left the garage leaving us a space! (Karma, plain luck, I don’t know :)). Once parked it’s indeed really easy. Simply getting the CT card and we hopped on the 14:10h train to CT 🙂 We where back around 21:00h and had to pay a little over € 10,- so that was not too bad (as here in the Netherlands parking garages can be much more expensive). Anyway, next time we might go this way again. However, if it’s not in off-season I would surely try to reserve a parking spot beforehand (although the website is definitely NOT mobile friendly! ), because you need a bit of luck (or you need to get there really early). Hi I want to that you for this super useful and well written information which meant I appeared to be a travel genius when we arrived in La Spezia this July with cars driving round and round the very hot town looking for parking spaces and we were able to glide instantly into our pre-booked parking space. One thing to watch out for is that the signage is so bad that people without a booking queue in front of the barrier you need to get through – we had to ask 5 cars to reverse so we and another pre-booked car could get through. Signage in Italy is notoriously terrible. I wish I could go fix it all! Ugh. Stumbled across this page and feeling very grateful I did, looking forward to reading more of your information. But wondering if you can help me with a decision – we are travelling to Cinque Terre with our 2 and 4 year olds. We will stay 4 nights there (yet to be confirmed where exactly) and need to park our car somewhere prior – where is best? Monterosso , Levante or La Spezia? Or with the kids would you advise to stay outside the Cinque Terre and travel in each day? We try and travel light luggage wise, but obviously can only have so little! With two little ones + a car your best bet would be to stay in Monterosso (it’s nice & flat with easy beach access for the kids). I would book accommodations there that offer parking (or can arrange it for you). From Monterosso you can easily visit the other villages by train or ferry. We have our accommodation in La Spezie. Is it secure to park a rented car in La Spezie on the street, near our accommodation? Thanks a lot Amy. It was about scratches, not break-ins. 🙂 Do you have to pay for parking on the street in La Spezia? 95% of the street parking in La Spezia requires payment. The free parking areas are harder to come by (and oftentimes full). Door dings and whatnot are a common occurrence, as with any city. Thank you for creating a very informative and helpful website. Yes, you’re absolutely right about the Palaspezia parking lot. I haven’t mentioned that option here because while it may be okay for parking for a few hours I wouldn’t particularly recommend leaving a car there for days. I believe there have been break-ins there as I’ve seen evidence of broken glass/windows when I’ve parked there to go to the cinema or UniEuro. Of course, that can happen anywhere, but the location is quite isolated and not overlooked (unlike the Piazza d’Armi free parking lot which is surrounded by residential apartment buildings). Thanks for the tip Amy. I wasn’t planning to park there as it’s far from the station, and maybe it’s not the safest place either. On the other hand, do you have any thoughts on taking the train to Cinque Terre from the Migliarina station? The fare to any of the 5 villages is only 1.20 euros more and there appears to be free parking there as well. That’s a much better solution than parking at Palaspezia, in my opinion. Just keep in mind that for the majority of the options you’ll have to change trains at La Spezia Centrale, which isn’t ideal if you’re heavy with luggage. Use the TrenItalia website to check train times in advance (www.trenitalia.com) so you can coordinate yourselves and catch a train that won’t require any changes. 1) It’s a secondary station and pretty deserted. There’s no ticket counter there (just automated machines). There’s also no TI point or place to purchase Cinque Terre Cards, etc. (you’d have to get that at La Spezia Centrale or at one of the five villages). 2) The Migliarina station is in a residential area (with a newly constructed shopping mall not too far away). The free parking may not be plentiful because many local residents use it for their own vehicles. There’s not a huge turnaround of cars coming and going like there would be around La Spezia Centrale. With that said, if you drive around enough I’m sure you’ll eventually find one! Just don’t park long term in the mall’s covered garage (but their uncovered spaces not within the garage would be fine). I am going to visit Cinque Terre on September (19.09.2017). Is it possible to make reservation for parking in La Spezia two months advance? The parking registration asks for my social security number, is that safe? Just thought that was a little strange, have you ever heard of that being a problem? Don’t use your social security number! It’s actually asking for a “codice fiscale” which is a combination of numbers and letters that each Italian resident has (it’s not anything that needs to be kept secret like your SSN). Go ahead and try making up a number and see if it accepts it (you may have to try multiple times). If not, you can email them and they will help you bypass that step.